I started to look into natural, ecological friendly laundry detergent a few months back after I read that many of the cleaning chemicals in conventional detergents are petroleum based and they cause environmental damage to rivers and lakes, and the aquatic life that lives there, and are endocrine disruptors that can affect our metabolisms, reproduction, and growth. One of my main concerns is my family especially my child’s exposure to all these chemicals. I learnt that laundry cleaning product manufacturers are not required to list all the ingredients on their packaging which make it difficult for us, consumers to make informed decisions. Detergent surfactants were developed due to a shortage of animal and vegetable fats and oils during World War I and World War II, while petroleum was found to be plentiful for the manufacture of these surfactants. Since then, the laundry cleaning products contain chemicals derive from petrochemicals, which are harmful to our health and the environment. Our skin can still absorb those chemicals and toxins into our bodies when we wear our clothes. Most manufacturers add optical brighteners to their detergent formulas. They are chemical ingredients added to laundry detergent to trick the eyes and make clothes appear brighter and whiter than they actually are. By design, optical brighteners stay in clothes after washing, which may cause skin irritation. Watch this Japanese TV show [video] on optical brighters. Optical brighters make fabrics glow in the presence of ultraviolet light. They are not easily biodegradable, toxic to our environment especially some aquatic life, as they escape the water treatment and was down our drains into our lakes, rivers and streams affecting and accumulating in the fish. The fresh lavender smell of our afterwash clothes does not equate to clean and chemical-free clothes. The term “fragrance” on an ingredient list means the product contains a chemical cocktail of dozens of unknown substances with limited safety data. We do not know what chemicals are used in them. They can cause irritation to skin and eyes and are suspected carcinogens. See this chart to help you avoid harmful ingredients found in many laundry products. 1. Make your own laundry detergent. I have not tried making my own detergent. I will definitely give it a try one of these days. 2. Choose an natural eco-friendly detergent. 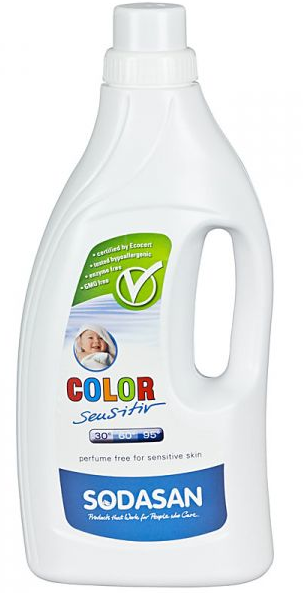 I’ve tried Sodasan ecological colour laundry detergent and I’m pleased with the results. It is manufactured with high-quality organic vegetable oils. The natural scent is from the pure essential oils. It contains no enzymes, coloring or preservatives. The washing substance of the product is soap and is fully biodegradable. Dermatologically tested. I like the light natural scent of our clothes after wash. It gives me a peace of mind to know that it does not contain any harmful chemicals that will affect our health and the environment. I’m transiting to a more eco-friendly and safer household and skincare products for a cleaner and healthier family. How about you? 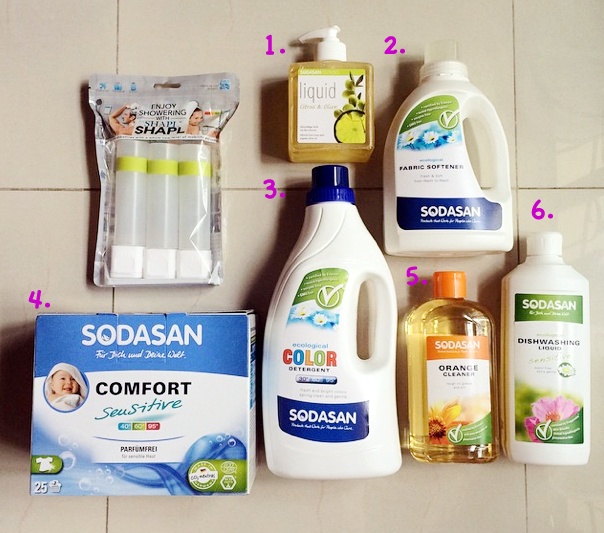 Disclaimer : I was given Sodasan’s products for review and all opinions written here are mine.